Scientists have identified a completely new type of meteorite. The 8cm space rock is said to be chemically distinct from any of the 50,000 other such objects held in collections. Called Österplana 65, it was found in a limestone quarry in Thorsberg, Sweden, that produces floor tiles. Dating suggests the meteorite's parent body was involved in a huge collision in the asteroid belt between Mars and Jupiter some 470 million years ago. This would have been the same smash-up that produced a large class of other rocks known as L chondrites, Birger Schmitz and colleagues tell the journal Nature Communications. The L chondrites are picked up in significant quantities in the Thorsberg sediments of Ordovician age - a period in Earth history when the Northern Hemisphere was largely under water and marine lifeforms such as the trilobites were flourishing. Dr Schmitz' team has recovered more than a hundred of these "fossil" objects in the quarry. But the new meteorite stands out because geochemically its oxygen and chromium signatures are distinct. 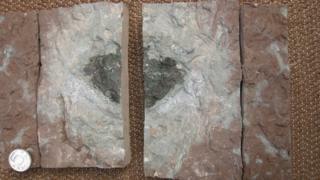 "We've been hunting these Ordovician meteorites for 25 years. We found 50, then 60, then 70 - and it was getting boring," he told BBC News. "Then in 2011, we found one meteorite that was entirely different. For a long time we called it 'the mysterious object' because it didn't resemble anything. For five years, we have done all types of analysis and now we're certain of what it is." The hypothesis is that Öst 65 comes from the "second asteroid" in the collision. The scientists can make this claim because of the results of so-called cosmogenic dating. This is a technique that will reveal how long the fresh surface of a broken object has been exposed to space radiation. Impacts from high energy particles generate particular types, or isotopes, of atoms in the rock - in this case, it is forms of helium and neon. The more of these isotopes that are present, the greater the time since the fragmentation event. When this dating is done for the L chondrites and Öst 65, the exposure times line up. "We show that Öst 65 was liberated from its parent body at the same time as the L chondrites were released from their parent body, and that's very strong empirical evidence that this new meteorite comes from the same impact," said Dr Schmitz. The discovery reinforces the idea that different types of meteorite have fallen to Earth through geological time; that the space rocks we find on the surface of our planet today reflect a somewhat different Solar System to the one that existed 500 million years ago. Dr Schmitz refers to Öst 65 as an "extinct meteorite". Just as the trilobites eventually died out, so other members of the Öst 65 family are likely only to be found in fossil sediments like those at Thorsberg. Dr Schmitz' meteorite hunt in the quarry is certainly more interesting now: "It used to be that they threw away the floor tiles that had ugly black dots in them. One of my co-authors on the paper, Mario Tassinari, contacted the quarry owners to ask them not to do that. The very first fossil meteorite we found was in one of their dumps."